Who were those masked men and women? When the vengance of villans violates the virtues of free vocalization, one must veil their visage via the mask. All alliteration aside, Scientology has a history of harassing its critics in and out of the courts. So now there is a movement of protestors illuminating problems with the Church of Scientology that is remains masked. Electronically distorted voices narrate YouTube videos about Scientology,. Demonstrations outside Scientology facilities have been manned by people wearing masks (and playing "Never Gonna Give You Up" on boom boxes, creating the largest public Rick-Rolls). I doubt they were trying to emulate comic book vigilantes, (in spite of the frequent appearances of Guy Fawkes masks, as used in V for Vendetta), but the theatricality of it all captures all the trappings of them (without the fighting, of course). Normally I find anonymous speech less persuasive and a touch cowardly. But knowing Scientology's tactics with critics. It's justified, and highlights some of what is wrong with it. I also usually find protest movements pointless as they often do not educate or persuade anyone, and are more to make the protestors think they are actually doing something. But I the unique flair that's been brought to this anonymous campaign I think has a chance of attracting the attention of people who will then seek out the more substantive arguments against Scientology. The original link in the opening paragraph was to an article on the Scientology protests by Jules Crittenden, which is no longer online. 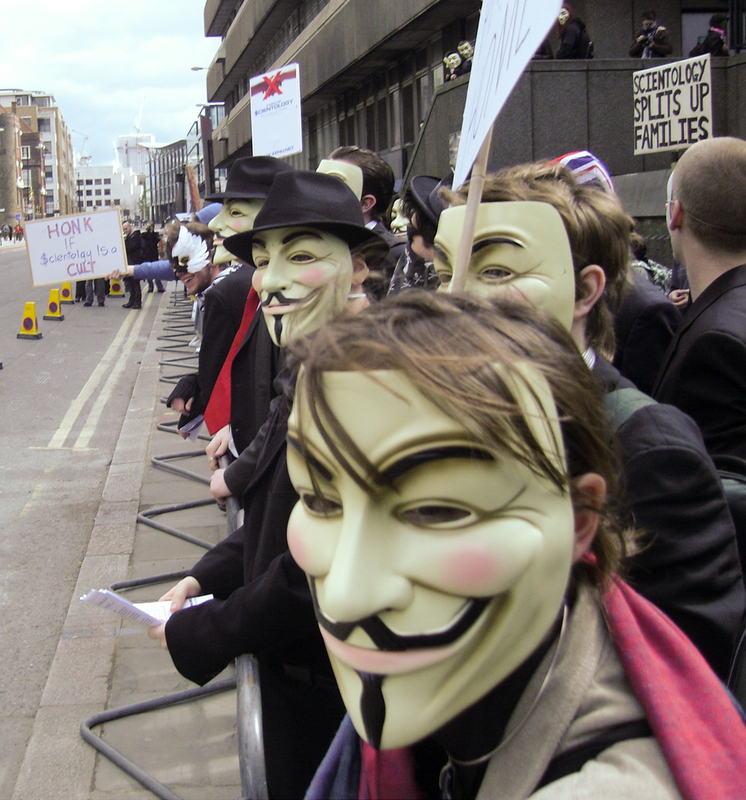 It now points to a Wikipedia article on Guy Fawkes masks, and their use in protests.